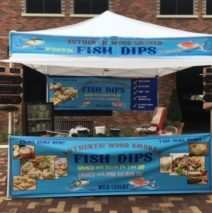 Captain Jo’s Smoked Fish Dips slow smokes their 100% wild caught fish (the Yellow Fin Tuna is caught local to Central Florida) using sweet woods, then chops and mixes them with a special blend of organic herbs and spices. The mixture is blended into a rich and creamy base to create the most delicious, smooth yet chunky fish dips ever! They use only wild caught fish that is gluten-free and GMO-free with no added preservatives. It is 100% fish with no fillers! Samples are happily offered garnished with customers’ choice of Captain Jo’s homemade jalapeno pickles, red onions, or capers. Their food has been referred to by many a happy Market customers as “heaven on a cracker”! Visit them and taste for yourself!